The freedom of being your own boss doesn’t exempt you from filing your taxes like everyone else does. Self-employment declaration is significant for income tax purposes because there is an expectation of profit and evidence to support the existence and continuity of an enterprise. Overall, declaring yourself as a self-employed person means stating exactly everything you deal in, even if it is an activity that does not earn your business any profit. 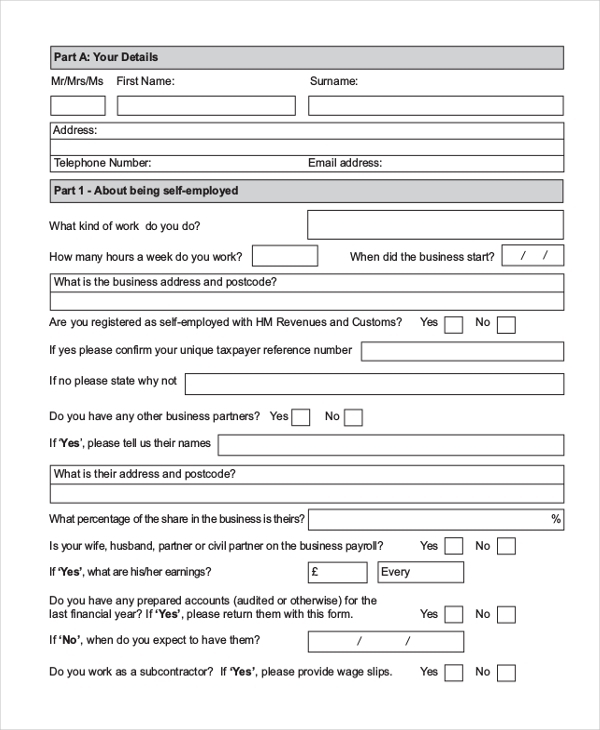 Use the following self-employment forms to provide information about self-employment. You may also use Employee Satisfaction Survey Forms. Declaration of income is mandatory regardless of your type of business. It is important to provide accurate information for review. You can use the Self-Employment Declaration of Income to provide the data. 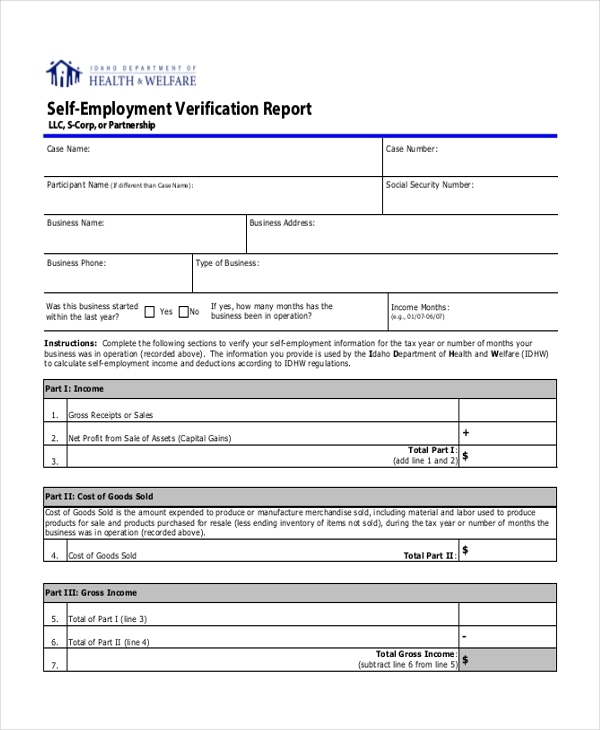 A self-employment verification report is an information you provide the authority in the case where there is an urgent need for you to verify that you are self-employed. Use this template for verification. Providing a self-employment earning report is necessary because, at the end of the day, you still have to pay taxes like everyone else. The authority thus requires that you provide accurate info about your business. There are many empowerment groups for the self-employed out there. If you would like to join any of these chains, you should fill a membership application and submit for reviews and approvals. It’s easy to get a self-employment micro loan to start a business. 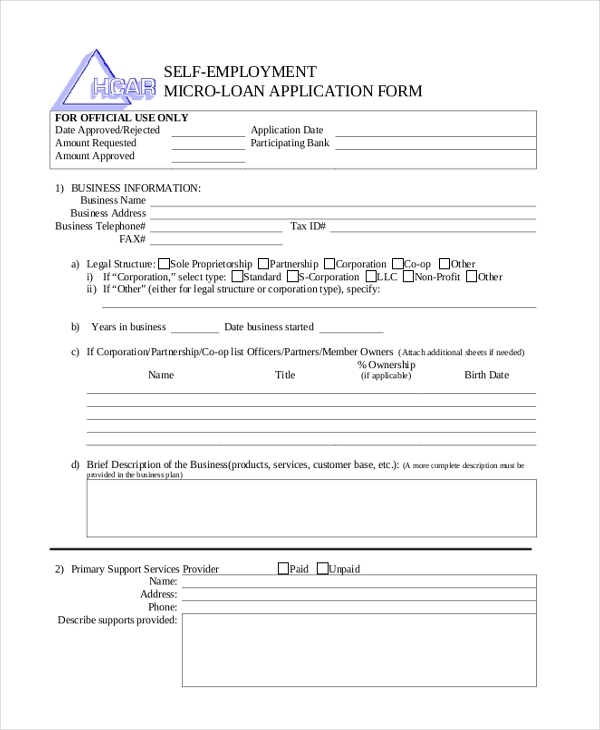 Whether you are seeking support from private lenders or a public corporation, you can use the self-employment micro loan application form to request a loan. For easy income tax benefits and reviews, it is important that you provide an accurate self-employment claim. 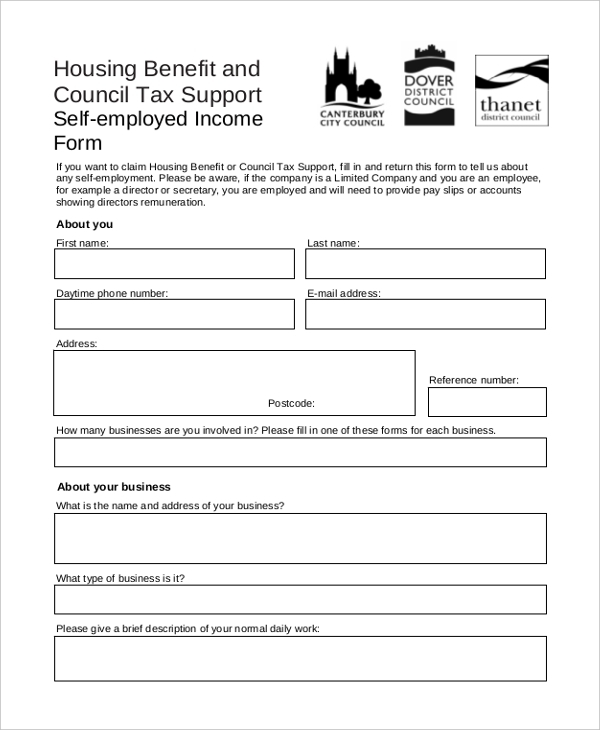 You can do this by providing the necessary information using the self-employment claim form. 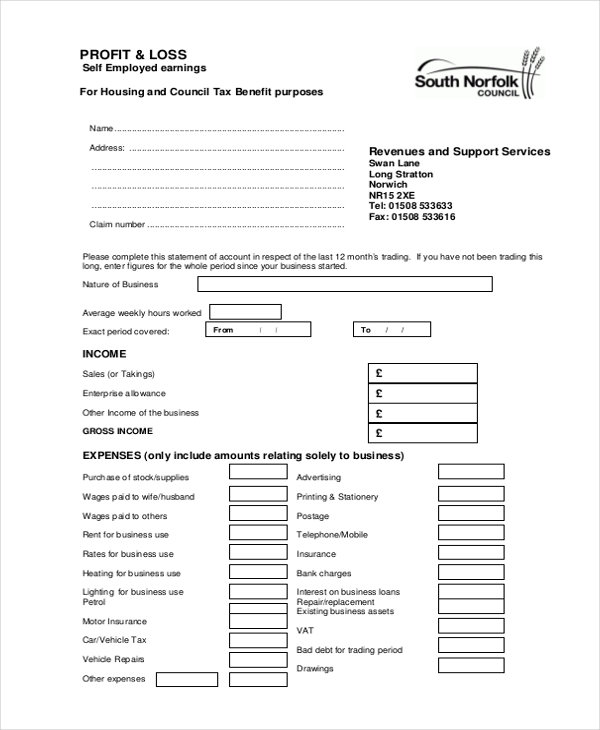 You can use a self-employment ledger form to provide an up to date information about what your business deals in. 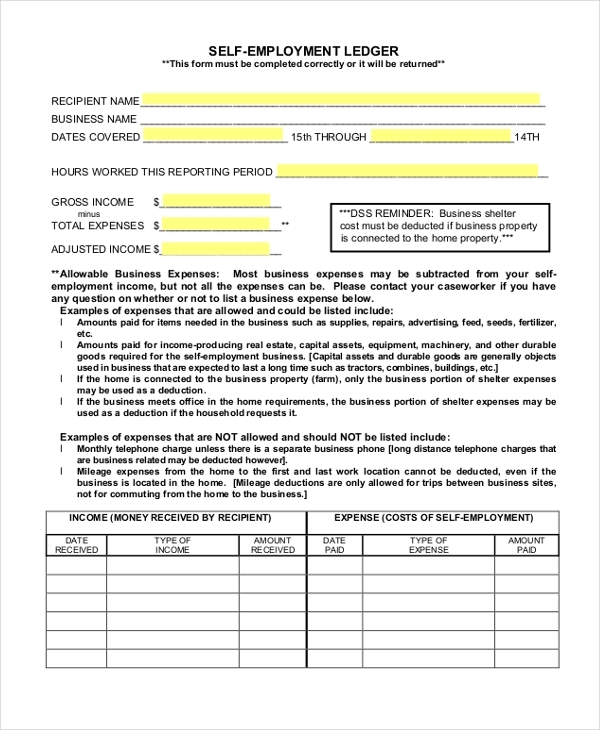 Whether you are a small business owner or a fast growing chain of personal businesses, this form is for you. Regardless of your choice of business, you will still have to write a report of your business income. The type of return you complete is quite significant. It is important to provide relevant information for accurate income taxation. Declaring the profit and loss your business made over a given period of time provides accurate details about the sales of your business during those times. 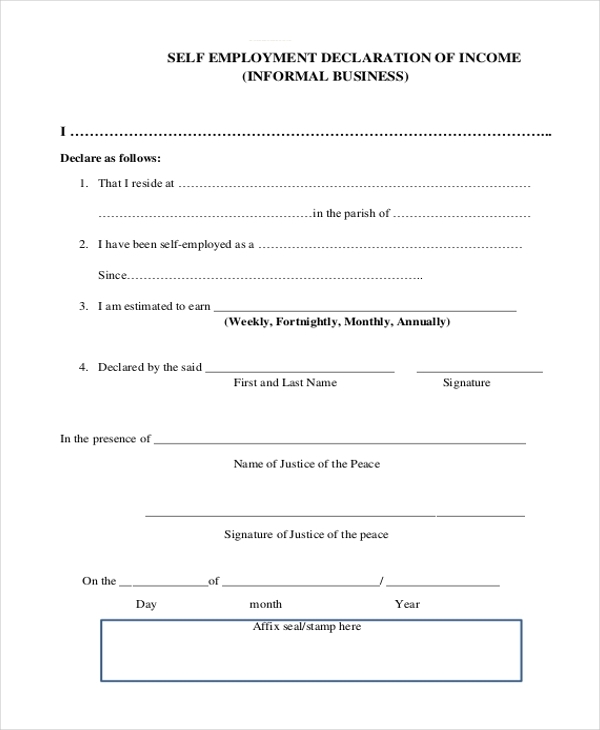 Outline the relevant details on this form. What is Self-Employment in Relation to Income Tax Purpose? First, there must be enough evidence to prove that you are actually self-employed as you claim. The best way to verify the claim is to provide a self-employment verification report. As a verified self-employed individual, your business is defined in the terms of goods sold or services provided with am an expectation of income and profits thereof. For the sale of income tax purposes, it is proper to include only those activities that generate profit to your business, although you have the liberty to record those goods and services that don’t necessarily earn your business any profit. It is important to understand that as long as you are self-employed or you have people working on your behalf, it will be a must that you provide a report about your business. Know that how you report your business depends on the structure the enterprise. Usually, the structure of your business will determine the type of returns you complete as well as the income of your business. Additional information to provide is whether you are an employer, the type of your business, whether you conduct your business on the web or not, and the format used for business information recording. 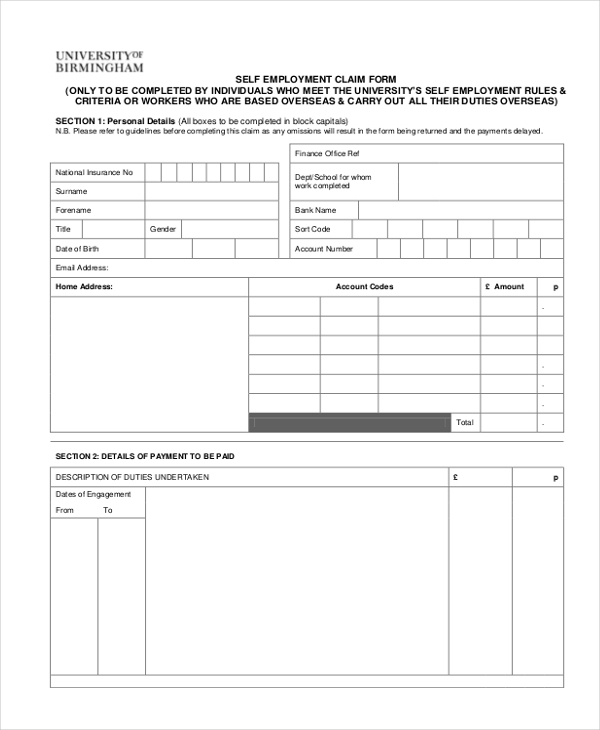 Useful Employee Clearance Forms. What’s the Purpose of Self-Employment Income Reporting? The purpose of reporting is to help you determine your earnings (profits) for the period you earn the money. You can use the accrual method to write your report. In this case, you record the payment in the fiscal period, regardless of the time you receive a payment. The same goes for business expenses; you must account them in the same fiscal period your business incurs them. 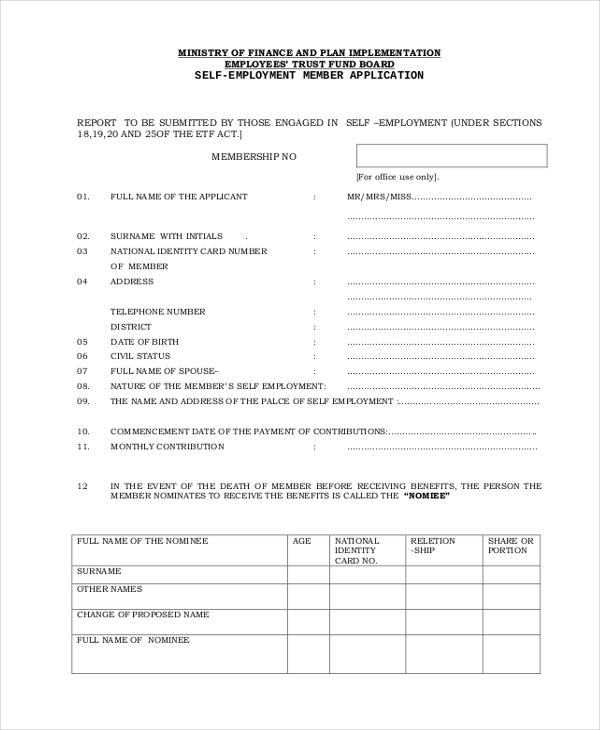 You can also see Employee Declaration Forms. Overall, the purpose of self-employment verification claim and business income report is to help your business earnings. Also, the report provided helps to show that you have paid the relevant income taxes as dependent on your business profits and the terms and conditions of business income tax payment.